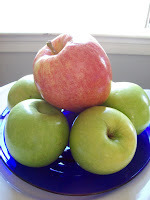 Napa Farmhouse 1885™: it is apple week...apple & pear crisp anyone? it is apple week...apple & pear crisp anyone? a couple of posts ago, i told you that i made the desserts for a good friend's wedding reception. i mentioned that the bride & groom asked for pies, crisps and cobblers...and, of course, homemade vanilla ice cream. the pies? fresh peach with pecan/streusel topping. the cobblers? strawberry/blueberry with sweet cornmeal biscuits...and the crisps? apple & pear. since then, i have had many requests for the recipes...from wedding attendees, from blog readers, from friends. well...it is a big secret, but i can't share the pie recipe just yet...stay tuned as to why. the bride, my good friend brooke, asked for the cobbler recipe to post on her wonderful blog aficionada. i feel like it is "her" recipe now...after-all it was served at her wedding!! and, of all the desserts, it was her personal favorite. so i am happy to provide the link to her post...check it out to see why she picked cobbler as her fave...get the recipe...and be sure to take a peek at the wedding photographs for one of the most beautiful brides i have ever seen. sometimes life delivers perfect timing because this week at fall fest we are spotlighting apples. how fall is that? what smells remind you of fall? for me, apples baking...either in pie or crisp...do it every time. so, even though it has been 100 degrees each day this week here in napa, (despite the fact that summer was actually very cool) the calendar tells me it is fall. and, since i have wanted to share this crisp recipe with you for weeks now...viola! the recipe follows. when brooke and i were discussing her menu i asked her if she had favorite fruits. her wedding was held on september 12, so we decided to stay "fruit flexible". the only non-negotiable for both of us was that the fruit be local, organic or sustainably grown...and delicious. happily, stone fruits and berries were still in season but...just to be safe...we also selected apples & pears as the combination for the crisp...but you can make it with all apples or all pears...any of the three options would be terrific. preheat oven to 375 degrees. butter a 9 inch deep dish pie pan (ceramic if possible). place prepared fruit in medium sized mixing bowl. pour in lemon juice to keep fruit from browning. add 1/2 cup brown sugar and spices and stir to combine. set aside. add flour and 1/2 cup brown sugar to work bowl of a food processor. pulse to mix. add cold butter and pulse until mixture is very crumbly. add oats and salt and pulse just to combine. 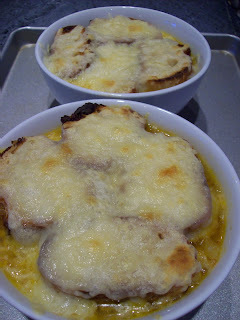 this is the last post eligible for the free cookbook! 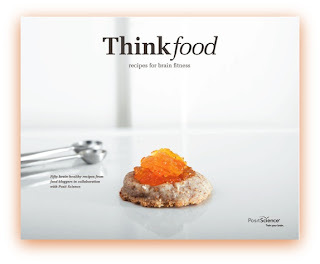 remember when i told you that i had a recipe published in a new cookbook thinkfood, recipes for brain fitness? i was thrilled to receive a couple of copies in the mail. i am featured on page 47!! i have decided to give away a copy...my first ever contest. all you need to do to enter is leave a comment on one of my september 2010 blog posts. tell me in the comments that you would like to be entered in the drawing. i will announce the winner during the first week of october...so be sure to check us out to see if you win. now it is your turn to participate in fall fest. simply leave your apple tip or recipe or favorite links in the comments below, and then go visit the collaborators listed on the blog away to garden and do the same. always...much thanks to margaret roach and deb puchalla for coordinating fall fest 2010. as always...its been a blast...happy fall everyone..
wow, it all sounds wonderful. I love the picture of your dog with that delicious looking crisp. Did he get a bite? thanks leslie...have a wonderful week too! hi nancy ha! :-) we do indulge mosey...but not with dessert. he really wanted some crisp..but settled for a carrot...he loves carrots..